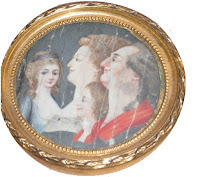 Rodama: a blog of 18th century & Revolutionary French trivia: Michèle Lorin, collector extraordinary! Here is an altogether more appealing collector of 18th-century objects. Michèle Lorin was inspired with a "passion for Marie-Antoinette" by the classic 1956 film staring Michèle Morgan and Richard Todd. She started collecting at the age of 12 has not looked back since. Her modest home in the Loiret is stuffed with Marie-Antoinette memorabilia of all sorts, some of it bric-a-brac, some of it valuable and interesting pieces. 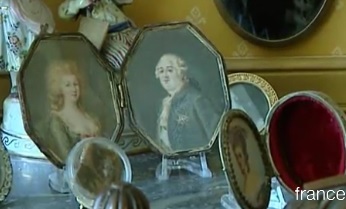 In the video, from a France 3 local news feature, she picks out a few items, notably a little miniature from the Queen's room in the Tuileries which was broken on 10th August. I also spot the miniature I wrote about in a previous post which shows Marie-Antoinette with flaming red hair. Michèle explains that she has amassed the collection by careful budgeting and a finely developed nose for a bargain; nowadays many of her finds come from ebay! Michèle Lorin is now an acknowledged Marie-Antoinette expert and something of a minor celebrity. She gave her advice for the 2006 Sofia Coppola blockbuster and can be seen on YouTube at the preview of the 2015 Rothschild sale. Bravo Michèle! It is nice to know that worthwhile 18th-century collecting is not the exclusive preserve of millionaires and professional dealers. Michèle previews the 2015 Christie's Marie-Antoinette Collection sale.